Sidney Chambers and The Perils of the Night is the second of James Runcie’s ‘Grantchester Mysteries’ featuring clerical sleuth Canon Sidney Chambers, who has already been acclaimed as ‘An Anglican Father Brown’. 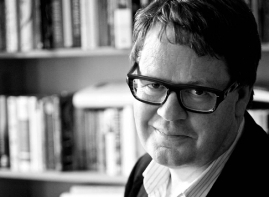 Shots’ very own Ayo Onatade quizzed James Runcie on his new novel (now out from Bloomsbury) and his planned series which takes his detective hero, and the reader, from the Coronation of Queen Elizabeth in 1953 to the wedding of Prince Charles and Diana in 1981. Ayo Onatade: Where did the idea for the main character come from and did your own home background have any influence? James Runcie: My wife Marilyn Imrie produces John Mortimer’s Rumpole of the Bailey for BBC Radio 4 and she kept going on about what a loveable and popular figure he was and that I should come up with something similar; a returning character who stood up for the innocent, cared about morality and justice, had certain eccentricities and was, at the same time intelligent and loveable. I did begin to think about my father, who was a priest and who became Archbishop of Canterbury. He was a much loved man and people kept telling him their secrets. They had the urge to confess things that they wouldn’t tell anyone else. They also came to him at times of crises, when they had suffered bereavement or betrayal, and so he was often seeing people at their most vulnerable, and when they couldn’t imagine what was going to happen to them next. This is the time when the crime writer also gets interested - when people are at their limits. And so I thought if I had a priest as a detective then he could deal with people on the brink. He could go where the police could not, and people would tell him things, and he could reflect on the morality of the situation. I could combine the idea of a “whodunit” with a “whydunnit”. So I came up with then name Sidney Chambers: “Sidney” after the loveable eighteenth century clergyman Sydney Smith, and “Chambers” as a little tribute to the barrister John Mortimer. Canon Sidney Chambers had never intended to become a detective. Indeed, it came about quite by chance, after a funeral, when a handsome woman of indeterminate age voiced her suspicion that the recent death of a Cambridge solicitor was not suicide, as had been widely reported, but murder. The first book runs from 1953 and the second from 1955-1961. What made you decide, from the outset, to write six books? I have been amazed at the pace of social change in my own lifetime, from post war austerity to our current globalized, capitalist, indulgences and injustices. So I wanted to combine crime with a social history of Britain (David Kynaston with murder). I think context and setting are vitally important and the great advantage with crime writing is that you can do more than one thing at a time; and so I want to tell the story of how the last few generations have taken us to where we are today. So I start when there was still the death penalty, when homosexuality was illegal, when few women had jobs ( before the pill, before feminism), and when everything was shut on a Sunday – and I’m going to take it up to the 1980’s when a more recognisably modern Britain really began. Each volume of the Grantchester Mysteries has six interconnecting stories - Why did you decide to write the stories in this form and has this caused any difficulty? There are six stories in the first two volumes – they have interconnecting themes and some of the plot details spill over but they are also quite contained. Ideal for television! Six episodes from each book, Sunday nights at 8 p.m,especially now that Poirot has finished. On a more serious note, I like the short story/novella form. There is an economy and a punch. You just have to get on with it. How do you manage to juggle your other work with your writing commitments and how difficult has this been? No one begs you to write and so it is an indulgence really. It’s very hard to juggle all the other commitments so the only way I can do it is to write before I do anything else. I get up very early- sometimes at 4 in the morning and then write for 2 -4 hours (then I sometimes, disastrously go back to bed). I only have two major writing tips. The first is this (write before you do anything else) and the second is; DO NOT CHECK YOUR EMAIL WHILE YOU ARE WRITING! (If you do that, the game’s over. The flow is lost). It’s also a good idea to write on an empty stomach. You can’t write if you’re full. Do you read crime fiction yourself and if so who are your influences/heroes? Yes, of course. I’m reading a lot of Ross Macdonald at the moment. Obviously, as background and to get the idea for The Grantchester Mysteries I read G.K Chesterton’s Father Brown series and a lot of Dorothy L. Sayers and P.D. James. But frankly the biggest influence (and I am afraid this may sound pretentious) is Dostoevsky. They say Wilkie Collins wrote the first detective novel, but the absolute lode- star as far as I’m concerned is Dostoevsky’s Crime and Punishment. I go back to it again and again. He is the Master. What made you decide to turn your hand to writing mysteries as your earlier books have not been in this genre? The thing about mystery and crime writing is that it gives you enormous freedom. It might seem limiting (there must be a crime, it must be mysterious, and, in general, you then set a few hares running before the case is solved) but, in fact it is amazingly liberating. Once you’ve got your plot you can do anything- and that’s what makes it such fun to write. And if it’s fun to write then hopefully it will be fun to read too.